MTCO Communications is a local, family owned company striving to provide quality home and business solutions for high-speed Internet, voice and All-Digital TV service. We are committed to supporting the communities we serve, providing first-rate customer service and technical support, and offering the latest in technological advances to make it easier for families to keep in touch, enjoy their connections to the world, and to help businesses grow. This commitment has brought MTCO from its roots as a small, independent local phone provider operated out of a house, to a respected telecommunications company dedicated to the future. 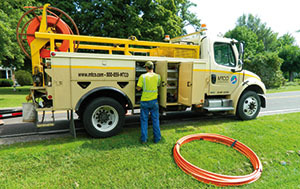 MTCO installed its own 75 mile Fiber-Optic Link between its offices in Metamora and Marseilles and continuing on to Chicago to enhance our network for cutting-edge services, content, and bandwidth needs. We continue to expand our fiber optic footprint throughout our service areas to deliver the innovative solutions our customers expect. MTCO offers Internet, TV, Voice & Gigabit Fiber Optic Internet Services in Metamora, Germantown Hills, Marseilles, and Washington, IL. Glenn Rauh, leads the company as president and CEO, Ann Dickerson: Chief Financial Officer, Brian Kettman: Chief Technology Officer, Doug Hawk: Director of Network Services and Tina Glidewell: Director of Sales and Marketing.